In the last 40 years, the concept of sustainability has gained importance within different scientific disciplines and as a discipline on its own. It has inspired businesses and governments, who integrated the concept in their visions and decision making. However, besides the good practice of local and regional initiatives or an improvement of one or the other sustainability indicator, not much has improved. On the contrary, #climatechange is accelerating, resource use and material throughput are increasing as are #biodiversity loss. Reasons for the wrong or too slow development are manifold. Is the wrong form of research one of the problems? Do we need to develop more transformative approaches to sustainability research? I do not think that current forms and results of #sustainability research are wrong. We can see that transdisciplinary and even co-creative approaches including innovative forms and methods such as action research, living labs, real life experiments, transition arenas etc. are increasingly important. This can be traced through the publications based on such forms of research, calls from funding agencies but also the feedback and resonance from (regional) policy makers and civil society who are part of such research projects. These research approaches aim not only to understand, analyse or evaluate #transformations (i.e. transformation / transition research) – they aim for transformative impact. The question that occupies me is: How to make those innovative forms of research even more impactful? Wise democracy is based on the impact of collective wisdom and builts on three fundaments: power, participation, and the intelligence and wisdom of process outcomes. These dimensions of democracy are always present in political or governance processes to some degree, and each can be improved. How could a “wise research” be described? A wise research is a holistic form of research. It integrates different forms of knowledge and intelligence, be it lay knowledge based on experiences, emotional and intuitive wisdom (inner wisdom) or cognitive knowledge, be it individual knowledge or knowledge that is held by collectives. It is outcome and process oriented and acts in an integrative manner by including diverse actors in a participatory and co-creative way. And, it is also based on scientific excellence, on existing knowledge, but also on the interest to gain new intellectual insights. In a wise research process all these dimensions should be integrated and applied so that the knowledge used is more comprehensive, integrative and effective. Co-creation uses the collective abilities and skills of everybody involved so that through unfolding everybody’s and the group’s potential, innovative ideas can emerge and the participants are empowered; excellence is allowing for depth and innovation. The following figure shows the three dimensions of “wise research”. I envision this form of research to help us develop a co-creative and deeply participatory culture for the creation of knowledge and impacts that support a good life for all now and in future. Why do I think that the results have a higher efficacy than current forms of research do? It might allow to better address wicked societal problems by (1) working with the existing disagreements or tensions between different stakeholders through the inclusive participatory process that explicitly welcomes different forms of knowledge but also emotions, belief systems or values; by (2) understanding a problem from diverse viewpoints (different forms of knowledge) and thus get a more comprehensive view; and by (3) having impact on the actors involved through first, second and third order learning, which might enable them to change their awareness, attitudes and eventually behaviour or decisions they take (as leaders) into a more sustainable way. As the researchers themselves are strongly engaged, they will also experience learning not only intellectually but also emotionally. (4) The possibility to better address wicked societal problems by finding deeper causes and allowing for exploration of existing tensions; providing a holistic approach to the interaction between individuals, society and science might lead to more meaningful results. Well, there is certainly not the ONE way to undertake wise research. 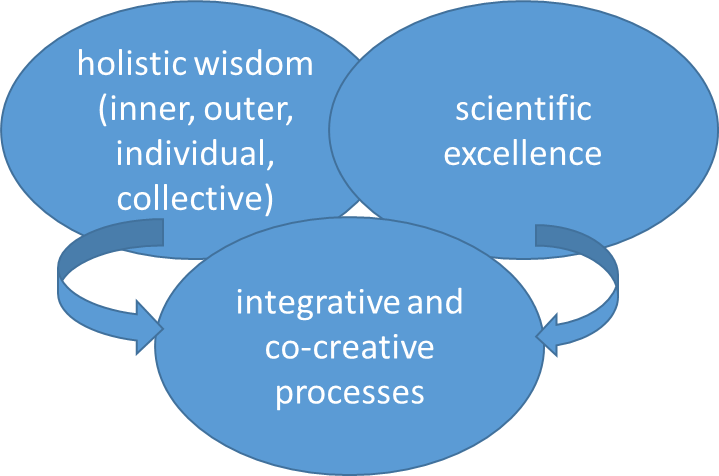 However, some guiding principles might support the emergence of holistic knowledge and scientific excellence within co-creative integrative processes. Appreciative attitude by researchers and facilitators, where all perspectives are welcomed, the power of listening is existent. If processes are hosted in an appreciative attitude, new innovative ideas with ownership can emerge from within (cf. Scharmer, C.O. 2008: Theory U: Leading from the future as it emerges. San Francisco, Berret-Koehler Publishers). Culture of collaboration, with the following patterns: partnership culture, spaces for dialogue, nurturing the “we the people”, metabolize polarisation etc. What is a wise researcher? My (if I am the researcher) own perception and attitude is important. An attitude of appreciation is the keyword here. It shows itself in the perception that those people that are there are the right ones, that everybody deserves to be treated with respect, even with love and in the belief that we are interconnected and the wisdom we need for a transformation can only emerge from the collective. This attitude requires experience as well as patience with myself and the ability to connect with my inner self. I should be able to show myself without hiding anything, showing my weaknesses, my values, my enthusiasm, my doubts. The more I open up, the safer the others feel and open up as well. I need to be prudent and caring, focusing on the person that talks but also observing the others, looking at their body language and approaching them directly by asking, whether they need anything, if it seems they do. This is not easy when I am hosting alone, therefore whenever it is possible, I do not host alone. And of course I also do need to have a scientific education and knowledge in the field I am working in. That way people open up, speak from their heart (the brain is always there anyway), say what really matters to them and in this setting of trust, innovative ideas that we urgently need for rendering a good life for all possible, can emerge.